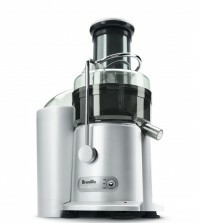 The Juiceful Review: The Breville BJE200XL, Elegant and Powerful! 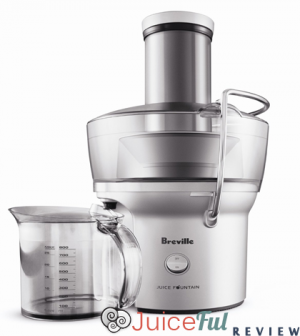 If you are looking for a small juicer but large benefits and huge offerings then the product required to satiate your need is Breville BJE200XL Compact Juice Fountain. It's efficient, easy to clean, and works like a breeze! Might clutter up a bit of space on your counter-top but if your not looking to showcase your juicer, then this is the perfect juicer for you! Even after having small size, it is power packed and comparable to its other high end variants. It is perfectly suitable for homes with space crunch and so you can have a glass of fresh juice every morning without having trouble to think about the space needed to extract juice. This product comes from the stable of Breville which is one of the most trusted names in the electronic appliance sector. Hence, with the quality, build and brand name of Breville this product is sure to go a long way in the market and will surely serve the needs of many people. As the name suggests, it is compact in structure and so requires a minimal space to fit in. Easy operation, maintenance and handling, makes it a dream to work with. Smooth functioning is a key to becoming one of the best juicers and so it lives up to that expectation. Although a Lilliput compared to the other high end, big and bulky juicing machines, Breville BJE200XL Compact Juice Fountain comes as a surprise with so many features loaded into one small machine by its standards. The dimensions of this juicer in inch are 8.75*9.5*16. It has a very simple execution process having an on/off switch with a single speed setting. A 3 inch wide feed chute is a very big asset for this juicer. With a hardy build and glossy finish, this product has centrifugal technology which reduces the time required to serve a glass of fresh juice. A 700 watt motor ensures impeccable performance for a machine of this size. It is very easy to setup and an internal pulp storing jar provides a fuss free operation. An add-on jar to store the juice and reduce froth also comes along as a bundle in the set. Simple build ensures that it is easy to clean and requires not much of shifting in this process. It has a trusted brand name. A sleek design has been loved by many and hence this product has made a mark for itself in the market as a medium sized compact electric juicer. There are very few cons to be seen in this product which include its size which may be boon as well a bane. It may not be to the liking of people who want more powerful machine and have no space problem to store big machines. Breville BJE200XL Compact Juice Fountain has earned a positive response from customers and is living way beyond expectations of its purchasers. It has got accolades for its sleek and compact design and loaded features. A very high rating of this product on various online marketing domains is a proof of quality and trust this product has garnered over the years. Ash and Mike are big timer juicers since 2011. We love everything about juicing...except of course for the cleanup. We're hoping you'll learn some new things about your juicing routine through our blog. From what to juice to where to get supplies cheap to cleanup tips, we're here to help you get the most from your juiceful experience. I want to start juicing. I have an unknown autoimmune disease and I think it would help tremendously!